The light weight design, strength and versatility of Layher Allround® modular scaffolding is providing combined access, heavy duty support and weather protection for a highly prestigious refurbishment project in Southern England – despite limitations imposed by the structure’s Grade I listed status. 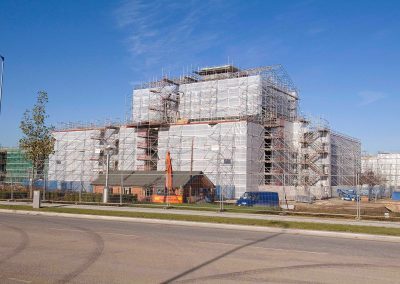 The £20 million project at the Farnborough Airfield and Science Heritage site – understood to be the largest restoration programme in progress in the UK – is centred on a building and location that are both steeped in history. Now being transformed for the needs of the 21st Century, it will be a high profile location offering residential, office and public venue opportunities. The Layher equipment is providing multi-level access to the external façade of Building ‘Q121’ – one of the three principal structures at the heart of the renovation programme – importantly, without any contact with the fabric of a building that dates from the mid 1930s. Additionally, a temporary roofing system is in place to provide protection at several levels. 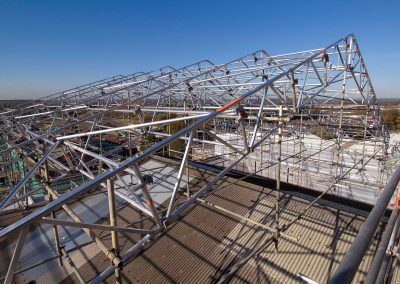 It benefits from an innovative Layher design that sees the design loads carried by supports directly through the roof of the existing building to lower ground floor level. An internal load-bearing birdcage structure is providing back propping and support through the roof area. 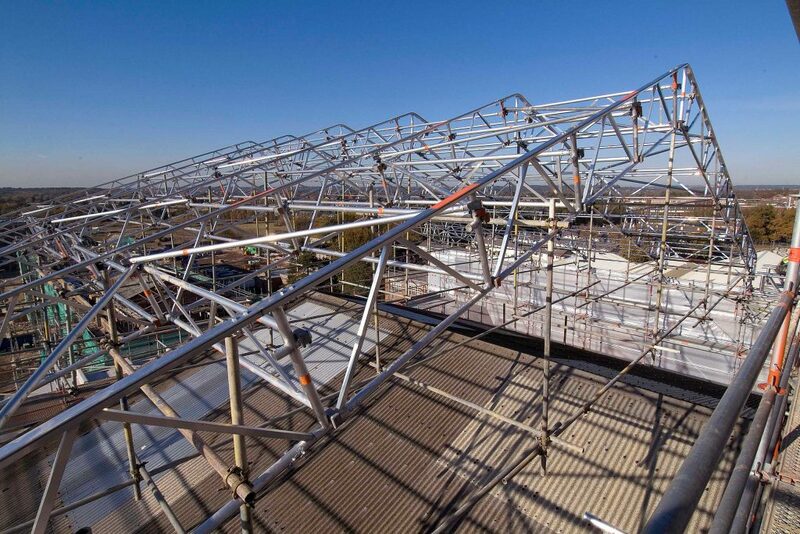 This forms and completes key elements of the installation which pays testimony to the design skills and project support components of Layher and Archway Services, to the inherent versatility of the Allround® scaffolding system and to the speed with which the system can be erected – Archway Services plc required less than three weeks per section using just 12 operatives. The need for the access and refurbishment activities to be of the highest order reflects not only the facility’s planned use following refurbishment, but also the history of this unique location. Scaffolding should always be erected by trained and qualified operatives following approved procedures. For technical advice and design support contact Layher Technical Department on 01462 475100.